Khabar: HTA’s Ganesh Chaturthi with clay idol-making, 108 kids doing homam, and a 10-foot robotic Ganapati! 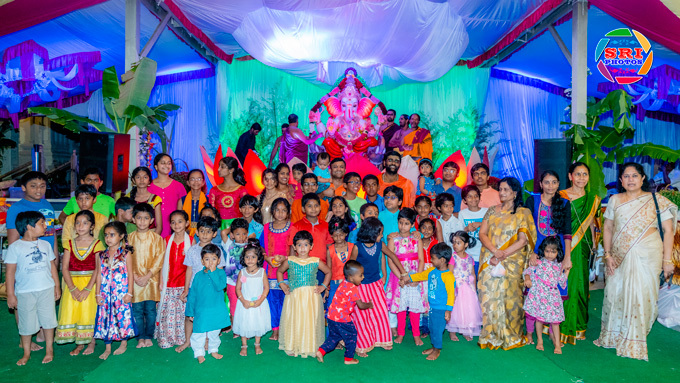 Home > Magazine > Around Town > HTA’s Ganesh Chaturthi with clay idol-making, 108 kids doing homam, and a 10-foot robotic Ganapati! 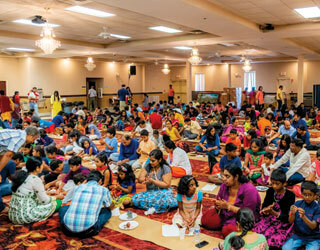 The Hindu Temple of Atlanta (HTA) in Riverdale, Georgia, organized its spectacular annual Ganesh Utsav celebration from September 9 to 15, 2018, attracting over 10,000 devotees from Atlanta and beyond. HTA has been hosting these Ganesh Utsavs for the past five years. This year HTA prepared for even bigger crowds since it was presenting a majestic ten-foot eco-friendly and fascinating robotic-moving clay idol of Ganapati, specially made in Hyderabad. It was installed at a specially built canopy in the forecourt between the Balaji and Shiva temples on Wednesday, September 12. A wooden stage backdrop under the canopy, constructed by volunteers, was an ideal setting for the dazzling idol of Lord Ganesh, resplendent with rich adornments, artistic décor, and lavish fresh vegetables, flowers, and fruit garlands. The majestic ten-foot eco-friendly and fascinating robotic-moving clay idol of Ganapati. Lord Ganesha is widely worshipped as the god of wisdom, prosperity, and good fortune. 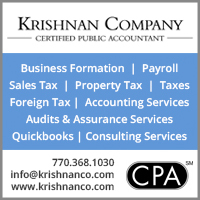 Traditionally invoked at the beginning of a new venture or challenge, he is known as vighnaharta (remover of obstacles). 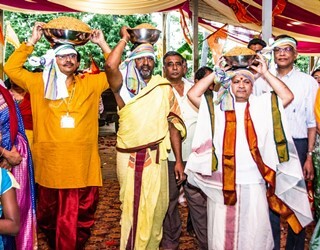 Throughout the Utsav, the elaborate rituals, archanas, and chanting of shlokas and Ganesha mantras were meticulously done by priests Sri Srinivas Sarma, Sri Pawan Kumar, Sri Siva Naga Kumar, Sri Sunil Kumar, Sri Gopal Bhattar, Sri Ravisankar, Sri Veda Vyasa, and Sri Murali Krishna. Devotees also enthusiastically joined in chanting “vakra-thunda maha-kaaya, surya-koti samaprabha, nirvighnam kuru me deva sarva karyessu sarvadaa” (O Lord Ganesha, with a curved trunk, large body, and the brilliance of a million celestial suns, please always make all my works free of obstacles). 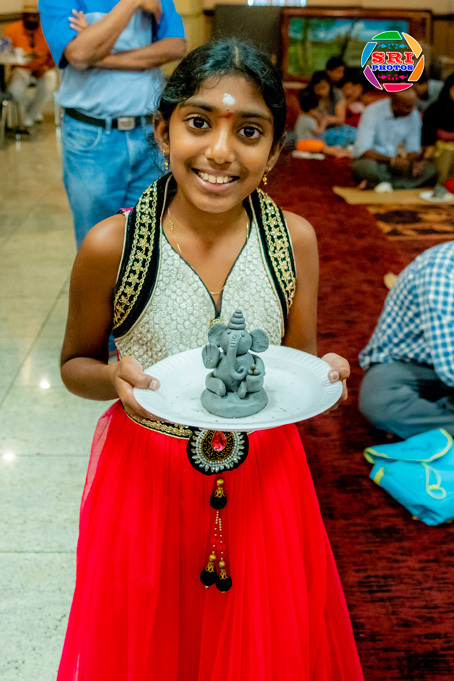 While the pujas and archanas were going on upstairs in the temples, a Ganesha-making workshop was held for kids in the banquet hall of the Balaji Temple on Sunday, September 9. The huge turnout was even better than last year. Families with children, parents, grandparents enthusiastically participated and made over a thousand clay Ganeshas. Tables were manned by volunteers who provided clay given by HTA. Some of the kids chose to use their own hands and skills to make the idols, whereas some used molds for quicker results! The event started with a prayer by HTA priest Sri Pavankumar, who chanted Vedic Ganesha shlokas. Participants sat on the floor and volunteers Vaisheshi Jalajam, Vikas Anand, and others went around guiding parents and children on making the idols. The reception desk was manned by HTA officers and committee members. Festive music was provided by nadaswaram and drum. As the day progressed, more students from Bal Vihar classes joined in. Vikas, who emceed the event, told the children about Lord Ganesha. He engaged the kids by making them recite shlokas, songs, and chanting together of “Jai Ganesha” and “Ganapati Bappa Morya.” Children were allowed to take their clay Ganeshas home. It was heartening to see children proudly showing off their Ganeshas crafted with love and devotion. Some created miniature ones whereas some created elaborate ones with serpent, trident, and jewelry. Barnali Guha and her colleague of Mystic Fun Art kept busy face-painting a long line of children! And there was balloon-twisting, too, for added fun. Temple President Kusuma Kotte welcomed all and congratulated the participants. The kitchen manned by Ramakrishna and volunteers was ready as always with mouthwatering South Indian delicacies. HTA provided laddu and vada for naivedyam, and parents brought Ganesha’s favorite food, modakam. The grand pooja concluded with Mangala Aarathi and blessings to the children. On Wednesday, September 12, the Ganesha idol was ceremoniously installed with much fanfare. For the first time, 108 kids participated in Ganesha homam. 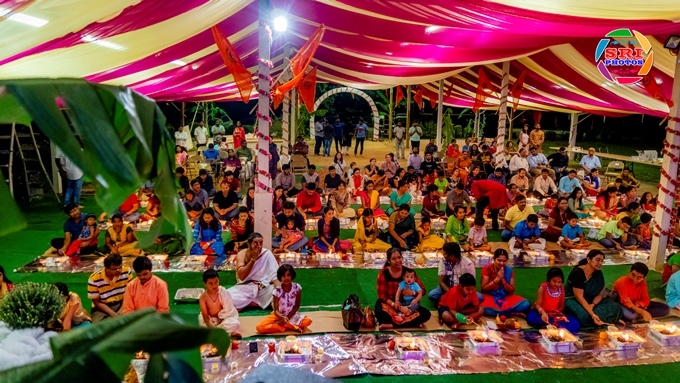 Temple priests guided the kids in performing the rituals—a laudable initiative by HTA, as children learn the rituals and the spiritual significance of homams. On Saturday, September 15, the festivities included a spectacular mela with nonstop entertainment from 10am to 9pm. The enthralling entertainment included Kuchipudi dances, such as Ganesha Pancharatnam, Ganesh Kouthvam, Bho Shambho, Dhansri Tillana, Hari Hara Gaja Mukha, and Mooshika Vahana dances performed by talented dancers Sasikala Penumarthi, Jyothi Chintalapudi, Pushyami Lanka Gottipati, Varsha Jinka, Haritha Kulkarni, Shweta Satya, Neelima Gaddamanugu, Sridevi Ranjit, and Aparna Turaga, among others. Children performed Bharatanatyam dances such as Shanmuga Kouthvam, Nrityavandana by students of Gayathri Subramaniam, and Vani Karra. Diya Ghosh who has just moved to Atlanta performed a scintillating Bharatanatyam dance. Carnatic and Hindustani melodious vocals were presented by students of Shweta Ravichandran, Parag Anamika Pal, Viji Murali, Poojitha Nookala, and Swapna Khumtekar. Kids donned colorful costumes and enthusiastically entertained the audience. Maya Dance Academy's students presented a ghoomar dance, while Shruti Sreedharan's students did Krishna Leela. Team Shakti's trio performed a captivating, fast-paced dance to a devotional prayer. Garima Dance Academy's raas-garba was also much appreciated. Extra flavor was added by high-octane Punjabi giddha and a rocking Bollywood Ganesha dance by Akhil Turaga team of Sri Dutt Raaga Fine Arts. The audience was treated to a pulsating authentic ancient drum-beat from Tamil Nadu by Mazhangu Parai team which had come all the way from Ohio to perform at the Festival. 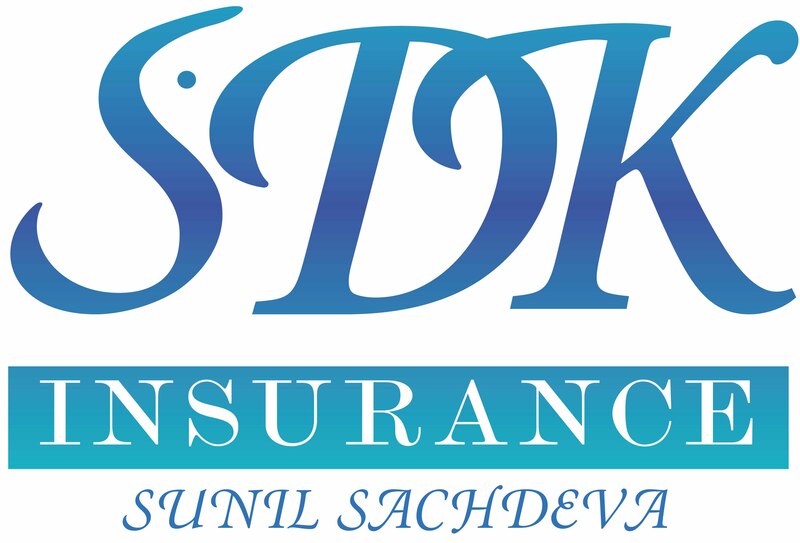 And as in previous year, teenmaar, dand pradarshan, and dancing to drums and dhols added vibrancy to the festival. Kids also enjoyed matka breaking or handi competition. Sri Pavankumar ji performed many poojas and bhajans. The audience were treated to a Lord Ganesha song composed by him. About 300 kids participated in the Arts Competition held in the Shiva Temple. Prizes were awarded to the winners of the competition, which was in three segments: coloring, drawing, and canvas. The temple chefs Ramakrishna Garu and colleagues had prepared three big laddus for auction. On Saturday, the lively laddu auction's three top generous bidders were Subbiah Emani and Raj Sardana (25 Lbs. ), Padma Koganti (10 Lbs. ), and HTA Vice President Sheela Lingam (5 Lbs.). All the money raised will be used for the temple kitchen renovations. Daily laddu auction's generous sponsors on previous days were Bhargava Vallabhaneni & family, Madhavi Kasam family, Phani Tummala, Sandeep & family, Kirty Vaggu & family, Janardhan Pannela & Family. Finally it was time to bid farewell to much-loved Lord Ganesh. Enthusiastic young devotees in kurtas and saffron headbands, carrying saffron flags, came out of the canopy, dancing and shouting “Ganapati Bappa Morya” to the pulsating beat of dhols as Lord Ganeshji’s idol was placed in a truck, and slowly carried in a procession. Two girls performed a scintillating devotional dance amidst thunderous applause. Ganesh Visarjan ceremony was performed in Savannah, with joyous shouts and wishes for his return the following year. As it is said, “with the immersion ceremony, the Form (physical) returned to the Formless (spiritual),” the Ganapati idol became one with the water. 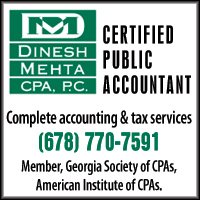 Ravi Chander, Volunteer Chair of HTA and organizer of Ganesh Utsav, said, “We have been hosting Ganesh Utsav at the Hindu Temple of Atlanta since 2012, with a wholehearted aim of bringing the community together and passing on our universal values of hard work, teamwork, togetherness, and kindness, to future generations. In a world of uncertainty Lord Ganesh has blessed us each year. It is a matter of joy to see a rise in selfless volunteers and a rise in visitors from all cultures. 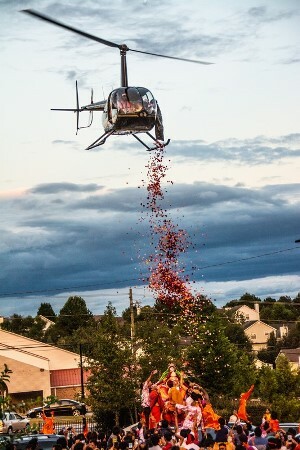 We are truly blessed.” HTA officers and volunteers worked tirelessly for months for all these grand celebrations!